Soliga is a Dravidian language. It is spoken mainly in Karnataka and Tamilnadu. 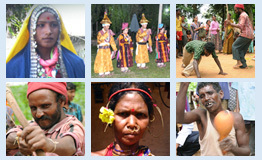 Soliga language is mainly spoken at home and within the community. Their communication with others is in Kannada in Karnataka and Tamil in Tamilnadu. The Soligas are popularly known as Soliga/Sholiga/Soligaru. Their main area of habitat is in the Chamarajangara district of Karnataka. The Soliga population is concentrated in and around the forest areas of Biligiri Rangana Hills and Male Mahadeshwara Hills of Yelanduru and Kollegala taluks of Chamarajangara district and also in the Mysore district and in the neighboring areas of Tamilnadu. Few minor sections of the community have spread over the other districts of Karnataka. According to 2011 Census, population of Soliga is about 33,871 in Karnataka and 5,965 in Tamilnadu. Their settlements are known as ‘haaDi’ and ‘pooDu’. Among many beliefs about the origin of the Soligas, the fact that their ancestors originated from the bamboo is the most believed one. The word ‘Soliga’ is a “corruption of the Tamil word colai or solai (a thicket) and refers to the dense thickets in which they live”, and Soliga is ‘the one from the Solai’(Luiz, 1963). There are three types of Soligas, namely ‘aidu-kula Soligaru (five clan), eeLu kula Soligaru (Seven clan) and hanneraDu kula Soligaru (twelve clan). They follow the Hindu religion. Their oral history reveals that they have close relationship with nature and forest. They adore the nature as their god. Their sacred places, namely, ‘Dodda Sampige’ and ‘Chikka Sampige’ are located in the deep forest area. Their ceremonies and rituals are limited in number. They celebrate important traditional festivals like RoTTi habba, Hosa Ragi habba and other agricultural rituals. They also celebrate festivals like Mari habba, Gowri habba, Sankranthi habba, Yugadi habba. Whenever the monsoons do not approach in time and they are troubled by a drought period, the Soligas take resort to invoke the rain gods by rituals of their own community. As a part of the ritual, freshly squeezed honey from the newly plucked honeycomb is poured over the idols of Gods like Karaiah, Basappa, Huliyerappa and other gods. They firmly believe that such acts would surely please the rain Gods and monsoon will set in. Soligas’ lifestyle of shifting cultivation, foraging and hunting was in tune with the seasonal cycle of the forest. The main occupation of Soligas is to collect minor forest products (NTFP) like gum, honey, soap nuts, root and tubers, tamarind etc. Soligas use more than 300 herbs for the treatment of various ailments. Now their habitation area has been taken under the Tiger Reserve forest. Presently, Soliga language documentation work is going on and a pre-pilot survey has already been conducted. In this research work, our aim is to produce a Trilingual dictionary, Grammar and Ethno linguistic profile.